Jar pad sensor helps prevent "wear & tear"
Auto Blend "One-Touch Sensor Blending"
Auto Blend "One Touch Sensor Blending" - Patent-pending technology continuously monitors blender's power usage and speed to determine when the perfect drink consistency is achieved. Hundreds of Pre-Programmed Cycles - Reduces the need to select different cycles for different drinks to free up decision-making time. 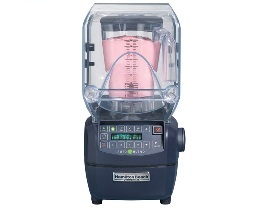 Automatic Shutoff - As soon as the mixture reaches the perfect creamy drink profile/consistency, the blender stops to help prevent over- and under-blending. Super-Creamy Drink Profile - The Wave~Action® System, along with speed and blade design, break down ice from a granita texture to a creamy drink profile. Airflow Baffle - Constantly circulates cool air around the motor for back-toback blending and longer blender life. Jar Pad Sensor - Turns off motor when container is not in place to reduce grinding and "wear & tear" from misuse.